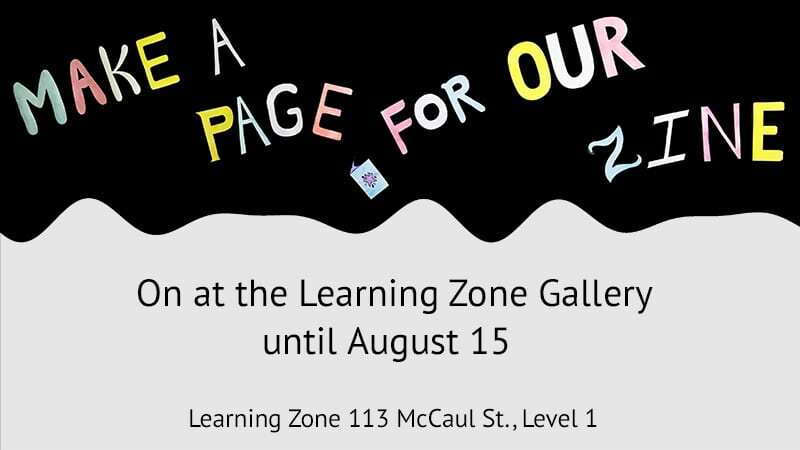 Make A Page For Our Zine is a participatory zine installation, installed in the Learning Zone Gallery for the summer. Inspired in part by Collage This Wall: Interactive Collage Experiment Installation (2012) and International Zine Month. Collage This Wall was an interactive collage experiment installed in the Learning Zone during the summer of 2012 which drew participation from members of the OCAD U community and public to create and share a personal collage. International Zine Month represents a global participation of DIY ethos that encompasses zine making and independent publishing. Various events like zine making workshops, readings and festivals are held and celebrated annually in the month of July. Make A Page For Our Zine engages with this same process, inviting interactivity and collaboration in the zine making process. At the conclusion of this project, the pages will be compiled, stapled and made into a zine then added to the OCAD Zine Library collection. The process facilitates the creation of ideas, and captures the collaborative work. Tags: exhibition, installation, performance, zines! Image citation: Between Friends/Entre Amis. National Film Board of Canada, Still Photography Division, Ottawa, Canada, 1976. McClelland and Stewart Limited, Toronto. This past October, the Writing & Learning Centre (WLC) hosted visiting artist Chantal Gibson , A Historical In(ter)ventionist and educator from Vancouver. During her visit, Chantal worked on a collaborative interactive altered book installation, called Between Friends. This event was held at the Learning Zone from October 30 to November 3. 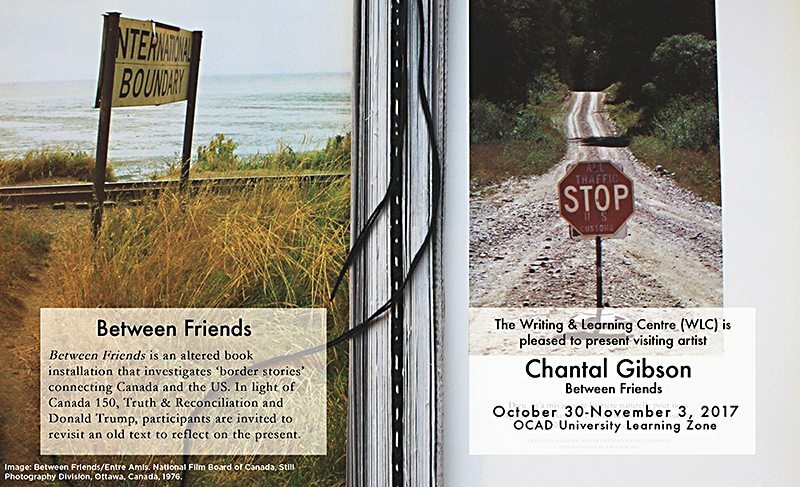 Chantal invited OCAD U faculty, students and visitors to participate in the writing of this book by weaving, braiding and linking their shared stories from past to present, across borders between the US and Canada. To learn more about the inspiration and the book Between Friends please follow this link or contact Stephanie Dayes (WLC) sdayes@ocadu.ca. February 21 is the final day to view Lucille Kim’s stop-motion animation/video performance, 1973 – 1979 at External Space, hosted in the Learning Zone. Lucille Kim’s art practice involves drawing, video, performance, sound and photography used in the explorations of self, and her Cambodian family history. Throughout the video, Kim performs coin therapy on her father, a healing technique that relieves aches and pains, and other illness of the body—connecting her to the pain that her father went through when working in Cambodian rice fields between 1973 to 1979, during the Khmer Rouge regime. For further readings on 1973 – 1979, download Alvis Choi’s exhibition essay. Come to the Learning Zone this summer and check out Xpace Cultural Centre: External Space’s latest exhibition video, 1st Place by Michelle Homonylo. 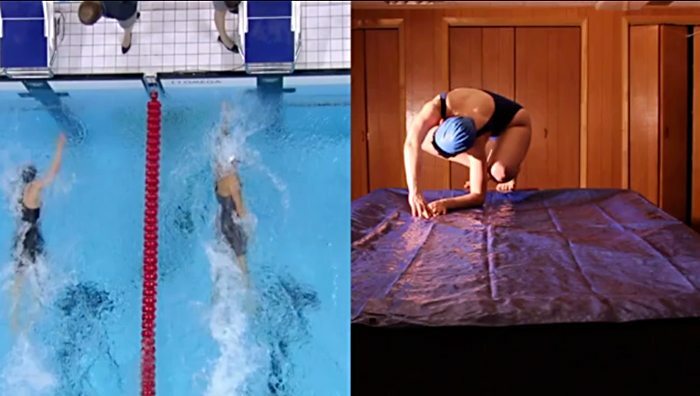 Homonylo’s usage of Olympic found footage and her performance portraying an Olympic swimmer are carefully constructed using split screens and cut-away techniques, to create juxtaposition between a competitive sporting environment and domestic space. The video’s imagery is modeled after Homonylo’s roots in contemporary photography. 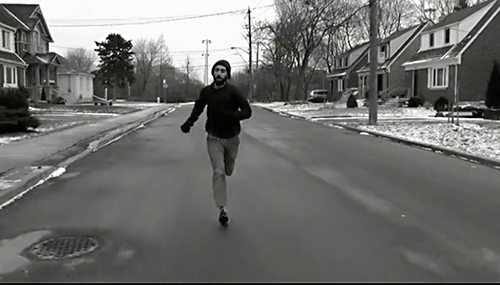 Run by Faraz Anoushehpour, a Toronto based filmmaker and graduate from OCAD U Interdisciplinary Master’s in Art, Media and Design, is a black & white one shot performative video depicting the artist running in the empty streets of a residential neighbourhood, to exhaustion. A major component of the work is the soundtrack, which creates a rhythmic pattern from the sound of the runner’s footsteps.